Lebeha Drumming Center shared a post. Warren and Clayton - Ready, willing and very capable 1 week 3 days ago. LEBEHA DRUMMERS Clayton Williams, Warren Martinez, Jabbar Lambey and Shaquille Martinez, professional artists, together for 15 years, unstoppable, unplugged and still performing the best Garifuna music in Belize. Photo courtesy Dia Lawless 1 week 4 days ago. HAVE DRUMS, WILL TRAVEL. Weddings, birthdays, any special occasion. Let's get the party started! 4 weeks 1 day ago. The kids on this recording aren’t cannibals but the Disney Corporation (purveyors of the Pirates of the Caribbean series) would like you to believe otherwise. The Lebeha Boys are barely-teen drummers from a tiny Garifuna fishing village on the Caribbean shores of Belize, Central America. Their ancestors came from West Africa and settled on the island of St. Vincent when their ship went down in a storm in 1635. They mixed with the local Carib Indians and formed one of the most unusual cultures found the in the world today. The British didn’t think much of their warrior ways and eventually sent them packing to the shores of Belize and Honduras. The Garinagu (as Garifuna people are called) survive today mostly fishing and playing traditional drums, dancing Punta, Paranda, Chumba, and John Canoe, and making elaborate foofoo and cassava meals. UNESCO has named them a world treasure but Disney portrays them as savage cannibals succumbing to Johnny Depp in the Pirates of the Caribbean Part Two movie (2006). These half-dozen kids play their little hearts out every night after school at the Lebeha Drumming center; they are as precocious on the drums, turtle shells, shakas and conch as any child prodigy violinist. If they could afford shoes they would go far in the music world, bringing infectious dance rhythms to the wider world. This binaural enhanced CD with bonus video donates the proceeds to their center. Received my CD of the Youth of Hopkins Drumming CD. Well worth it. I smiled all morning listening to it and attempted to shake my booty in the privacy of my own home. Could it be a resurgence in Garifuna music? This album of traditional Garifun music played by boys aged 10-14 from Hopkins, Belize, comes on the heels of Aurelio Martinez's "Garifuna Soul," and shows a different, more purely rhythmic side of the little-known Central American culture. The drums, shakers, and chants blend into a music with African roots and Latin-Caribbean elements. Garifuna villages along the Caribbean coast of Central America have a predominance of school-age youth and their grandparents, while their parents (adults in their twenties, thirties and forties) are working abroad. Given the extent of Garifuna emigration to North America, it is encouraging that young people continue to learn the traditional drumming and singing styles practiced by their elders. 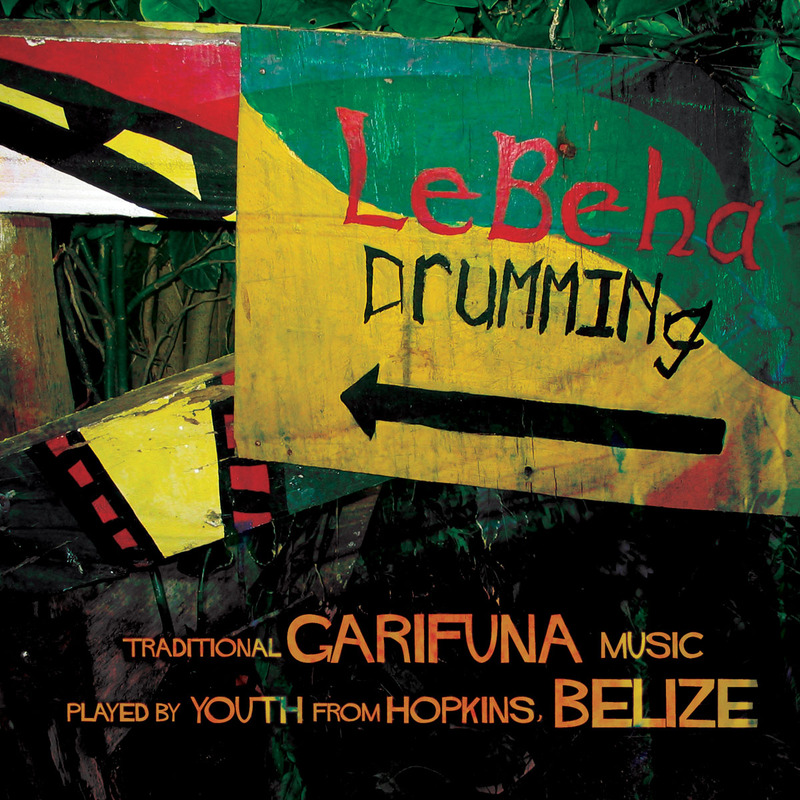 The Lebeha Boys are a loosely affiliated group of youthful artists who congregate around the Lebeha Drumming Center in Hopkins, Belize. In early 2005, producer and recordist Philip Blackburn made these field recordings and wrote the notes, which provide a brief overview of Garifuna history and music. What's particularly striking about this title is its aural affinity with now-classic Garifuna field recordings made by Ruth Stone in the early 1950s, and by Carol and Travis Jenkins in the early 1980s. This is an impressionistic judgment rather than a technical ethnomusicological appraisal, but the sparse instrumentation (a trio of Garifuna garaón drums backed by shakers and turtle-shell percussion), choral singing, call-and-response format and free-form dancing represent the tradition in its most unadorned yet compelling community manifestation. This is not commercially oriented performance, but an enduring form of communal entertainment with African and Amerindian roots that that pre-date the European incursion into the Caribbean. Many contemporary Garifuna musicians, including greats like Andy Palacio and Aurelio Martinez, bring guitar and other melodic instruments into the picture, but this disc boils it down to the essence. A group of Garifuna lads all under 15 years old let it rip on hand drums, turtle shells, shakers, assorted knick-knacks and vocals. The recording is raw and unpolished, the sound is brimming with youthful muscle reminiscent of early Olatunji and the effect upon listening is one of pure unpretentious pleasure. These kids have got it going on.